It was a surprise. Kati dragged me uptown to meet up with Jade and Alex. Under a ruse to get me out the house on a wintry Friday night, we emerged from the 2 train at 125th and Lenox. 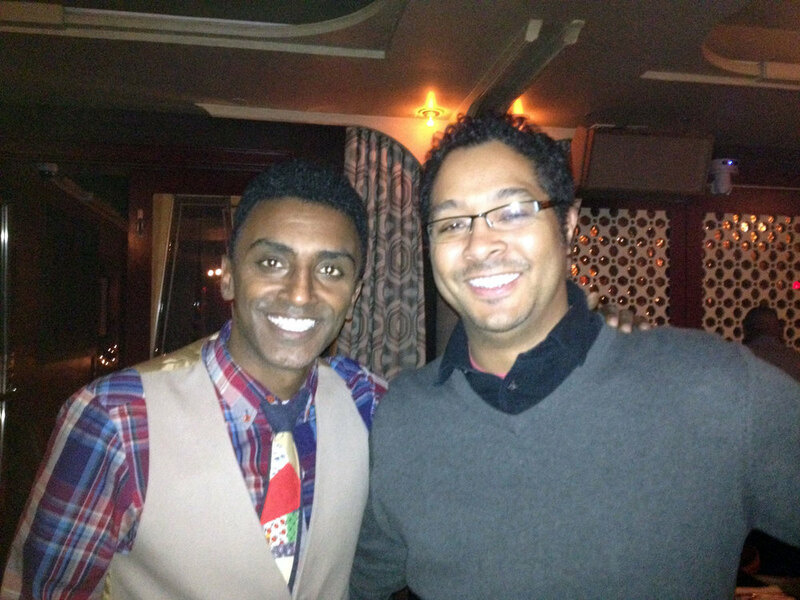 And right there was Red Rooster, Marcus Samuelsson’s landmark restaurant. It only took a minute to piece it all together. This was my birthday surprise. We entered and made our way downstairs to Ginny’s Supper Club downstairs from the restaurant. It was going to be few minutes for our table so we made camp right across the bar. In the blink of an unexpected eye, Mr. Samuelsson was crossing by. It was a moment that Kati and Jade had tried for days to orchestrate, but simply came together as we were at the same place in the same time. I couldn’t help but extend my hand and thank him. I’m not really a big celebrity chef follower. There are only a handful that I admire, and Mr. Samuelsson is one of the few. Unlike my Ferran Adrià moment last summer when I responded to the star chef’s asking where I was from by telling him my name, this time the words from my mouth made sense. Mr. Samuelsson was welcoming and accommodating to pose for a quick photo. Kati mentioned to him that we were here for my birthday, and the next minute our small party was blessed with flutes of sparkling wine. I didn’t specify why I thanked him, but I felt it was understood. His biography, Yes, Chef, is up there as one of my favorites. It’s honest and reveals tremendous depth that usually is hidden in public figures. Perhaps this is why I felt a familiarity with him. I feel we share a lot of things in common; I liked his sense of focus, discipline, and work ethic. The evening was truly an inspiration: to see and be in the space that is the result of his work and life.